It’s the last throes of summer….let’s play with flowers once more, shall we? 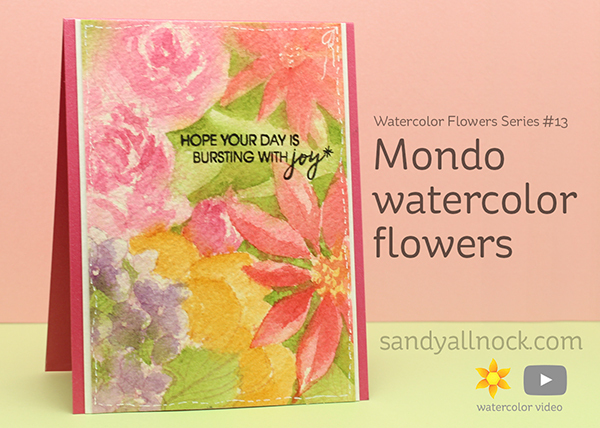 The Mondo Flowers series of stamp sets at Ellen Hutson – designed by the amazing Julie Ebersole – have a bunch of different flower shapes now. And guess what? They look like a beautiful garden when they’re together! I decided to make a watercolor background out of them all, and deployed the MISTI to make it come together. Watch the video below or click HERE to see it in HD on YouTube. 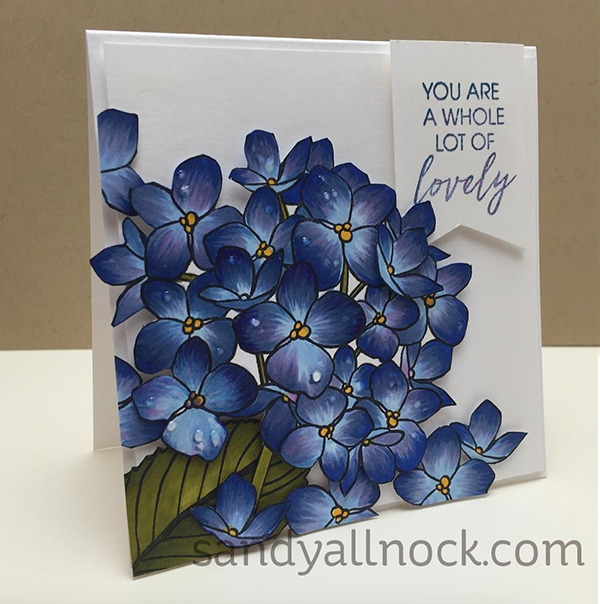 This technique would certainly work with other flowers – but these big Mondo stamps are particularly easy to paint with large open shapes. All are linked in the supply list below! 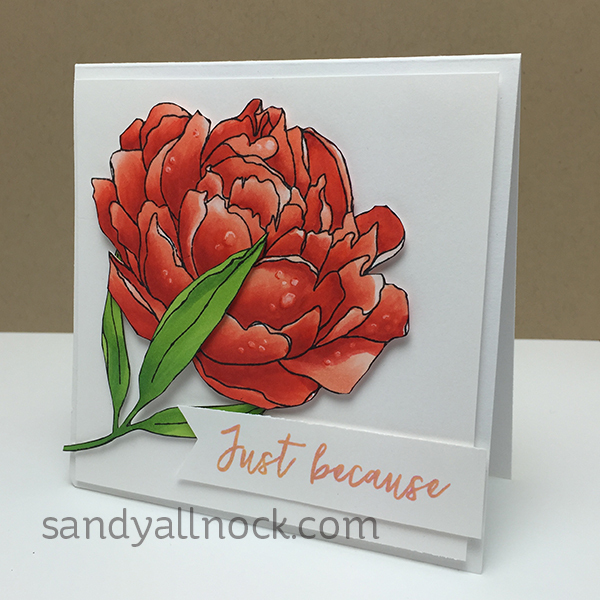 Yesterday on Instagram, I shared a set of cards made from these same sets, so you can see them more clearly as individual flowers…I cut 4-1/4″ square cards, with 4″ panels, fussycut the flowers and popped everything. I used the same “Lovely” sentiment set with them all. Oh my goodness Sandy, these are so beautiful, just gorgeous! 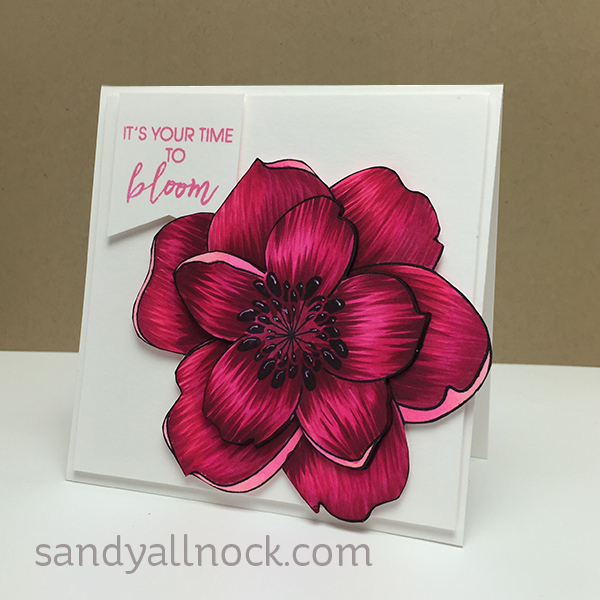 I don’t do many floral cards, but you make me want to. Wow, this card came out simply stunning! I did cringe every time you spritzed water after painting (could you hear me cry no, no, no!?) when I thought it was perfect just as is. I will try to spritz and layer more because I love this soft look. And thanks for the reminder to leave white and not paint every space, I’m a bit thorough with using up every spot! Gorgeous and a BIG thank you for your teachful thoughts. There was alot of helpful hints and mind process thoughts in this video. I will most likely play this one over and over just to listen. Your soooo talented but its helpful (and a little crazy) to know you have doubts and question yourself as you create. Have a FANTABULOUS weekend. Lovely cards. I like the card you made in the video, great water coloring. I like all the other cards as well especially where you added water drops, great detail. Gorgeous. Loved the video – full of great tips and information …. and encouragement. By the way, I’ve missed your watercoloring videos!! Thanks for the video! I admit, I cringed whenever you sprayed and took off color, but it all became beautiful! Way beyond me, but inspiring just the same. Was that 6 inch masking paper or tape? Sandy, this post is full of gorgeous! Your coloring is amazing. Just got finished with my order over at Ellen Hutson. My credit card may be melting. Love the fuschia flower!